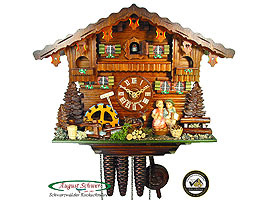 Cuckoo Clock with 1-day movement (mechanical). With music function and moving figurines. This beautiful Chalet Clock shows a romantic alpine chalet scene, a couple sitting on a bench and kissing each other each time the cuckoo calls. The waterwheel to the left also turns at the call of the hour. The clock itself is a nice chalet, richly decorated. The clock is completely made of wood, completely handcrafted. Wooden dial, hands, cuckoo, pendulum. Figurines and all details are also made of wood. The music box is Swiss made and plays two tunes: Happy Wanderer and Edelweiss. This is a premium quality clock: This means 5 years warranty; long-life chime, nickel-plated; antique-style chains, wooden knob on the night shut-off, real hinge on the cuckoo door. 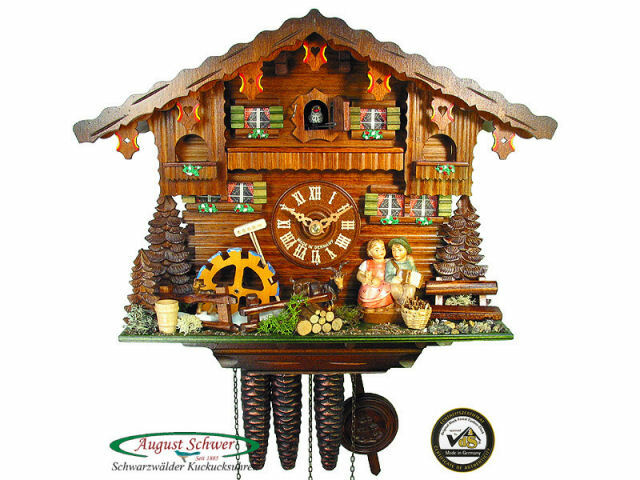 made by August Schwer Black Forest Clock Factory, Schoenwald, Black Forest. Free Shipping within Germany and the European Union!